Discussion in 'Apple Watch' started by pnewelljr, Apr 17, 2015. AFTER TRYING THE WATCH ON, which size do you plan on purchasing? I know we have this poll, but considering now that people have said the watch is shockingly different in person (I agree), I think it would be useful to make a new poll for people who have actually tried them on. Between the 2, 38 feels better and looks better, there is just no need for the larger size for me, my wrist is 52mm about 2" in width. They both display the same amount of information albeit slightly smaller on the 38. I've tried them on 3 times. I have both a 38mm and a 42mm on order. Still not sure which one to keep. 185mm wrist, 65 mm wide, preordered a 42mm and when I had my try on appointment, it was perfect for me. I have 145mm girly man wrists and have never thought to get anything but the 42. With 150mm circumfence and 50mm with i am still undecided even after two tryons. Would like the 42mm because of screen size. Regretfully, 42. Ordered a 38 for 4/24. Now: June. Without a doubt the 42. Before try ons started I would have told you I was undecided, but the 38 to me looked way to small( my wrists are 170mm). So glad I didn't order the 38mm which I had favourited. I thought I had small wrists (evidently not at 185mm, but hey ho), but the 38mm just looked way too small, and I don't really like massive watches either. The 42mm looked much better in my opinion. I would say, every man with a cirsumfence of at least 165mm and a with of at least 60mm can go with the 42mm without thinking about it. For 150mm - 160mm and 48-58 it is a very hard question. 42mm. I wouldn't be surprised if they got rid of 38/42 next year and bumped it up to 40/44. I preordered 42mm SS with Milanese Loop and was dead on in making the right choice for me. Love the size, casing and the band. The 38mm looks PERFECT on you. I don't understand everyone's inclination to wear big watches. 177mm/62mm here and I've preordered 2 38mm. joshen and bob24 like this. Agreed. That photo looks like it comes from an Apple store employee handbook: "Example of a customer you should nudge towards the 38." 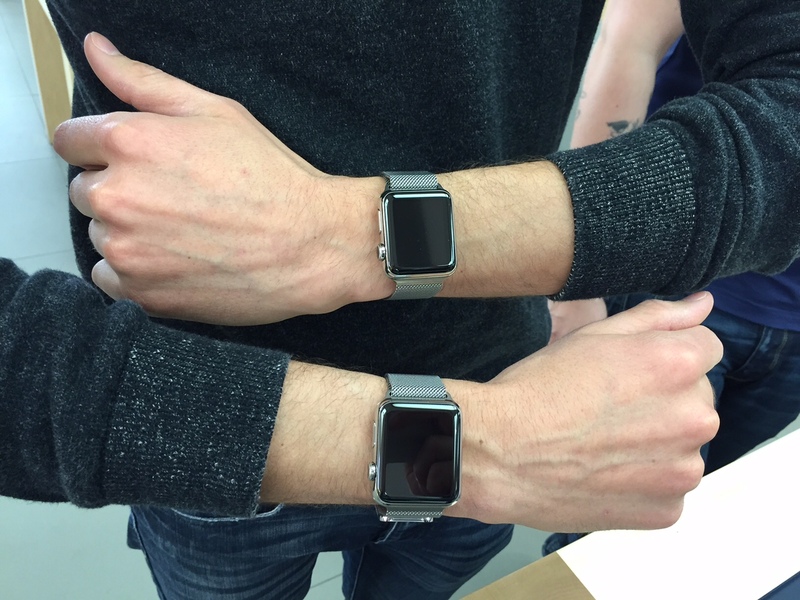 180mm wrists, 60mm wide, 42mm fit, but 38mm just looked less dorky. I'm going with the 38mm. Thank you, that is by far the most useful picture I have seen. I'm still undecided after 3 try ons. What people fail to recognize is that these watches look much smaller in person. I can almost guarantee if they were actually there when you tried them on, no one would say that the 42mm looks to big on you. 38mm was to small for me when I tried it on in store. I was actually considering it up until that point. We're in what is essentially the exact same situation. The good thing about our size/width is either of them look good! I preordered 42mm and will be sticking with that but the 38mm also looks great on you. Same here, I'm glad I ordered the 42 though! I've gone for the 38. My wrist is slim and 150mm circumference. I tried on the 42 and was happy with the width and height but it felt too thick. I know the depth is the same for both but the larger watch extended away from the flat part of my wrist so the edges floated off my wrist and seemed thicker.